Good summary by Raymond Ibrahim unmasking Western arrogance. Read his article here. One of the greatest problems with the much cherished “moderate/radical” Muslim dichotomy is that it’s entirely based on Western assumptions that have nothing to do with the realities of Islam. Islamic researchers are agreed that what the West and its followers call “moderate Islam” and “moderate Muslims” is simply a slur against Islam and Muslims, a distortion of Islam, a rift among Muslims, a spark to ignite war among them. They also see that the division of Islam into “moderate Islam” and “radical Islam” has no basis in Islam—neither in its doctrines and rulings, nor in its understandings or reality. 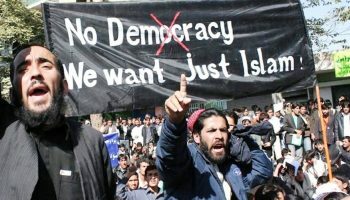 In keeping with various disturbing polls, the study found that everything associated with “radical Islam”—adherence to Islamic law (Sharia), subordinate position for women and non-Muslims, draconian punishments, jihad to spread Islam, and opposition to democracy—is a reflection of authentic Islam. Objectively speaking—from a doctrinal, historic, and even contemporary perspective—such observations are hard to deny. Yet the idea of the “moderate Muslim” continues to allure and resonate with many in the West. Forgotten (or suppressed) is that Western civilization did not develop in a vacuum. All values prized by the modern West—religious freedom, tolerance, humanism, gender equality, monogamy—are inextricably rooted to Judeo-Christian principles which, over the course of some 2,000 years, have had a profound influence on Western epistemology, society and culture. While they are now taken for granted and seen as “universal,” it’s not for nothing that these values were born and nourished in Christian—not Islamic, Buddhist, Hindu, Confucian, or pagan—nations. This is why there are no “moderate” and “radical” Christians. Catholic, Orthodox, or Protestant, Christians don’t have to “moderate” their religion to coexist peacefully in the secular West. The teachings of their holy book comport quite well with the laws governing society (unsurprisingly so, since many of these laws are based on the principles of that book). All this is missed by those ignorant of the spiritual and intellectual roots of Western civilization. They embrace notions of relativism and multiculturalism, the idea that all religions and cultures are the same and, more subtly, that they are destined to develop like the West, which is no longer seen as a distinct culture but rather the end point of all cultures. If the boons of Western civilization are not a distinct product of Christian principles, then they must be standard for and appreciable to all civilizations. According to this view, the Muslim is ultimately an embryonic Westerner. Whatever his religion seems to say—whatever he says—surely he appreciates the need to practice it privately, respect religious freedom, gender equality, and so on. Thus is he made “in our image” (except, of course, we forget the roots of “our image”). Overlooked is that the Muslim has his own unique and ancient worldview and set of principles—which in turn prompt behavior that is deemed “radical” by Western standards (falsely assumed “universal” standards). Such thinking is further arrogant and ethnocentric—two things that liberals always warn against yet constantly do. While the conservative acknowledges that Islam has its own principles, the liberal ignores these, believing instead that Muslims “are just like us.” This view, which arrogantly brushes aside Islam’s role in the Muslim’s life, doesn’t seem ethnocentric because the “us” is not believed to be particular (Western or Christian) but universal. Western egoism has gotten to the point that whenever Muslims behave in “radical” ways that are antithetical to Western standards—but consistent with traditional Islam—they are dismissed as mentally insane. Faith in moderate Islam is faith in the notion that a human can be both secular and Muslim at the same time. Portraying what at root is a Christian paradigm as “universal,” and then applying it to an alien culture like Islam, is doomed to failure. Christians can and always have lived and thrived in secular or even anti-Christian environments because Christian teachings transcend the law and render unto Caesar what is Caesar’s and unto God what is God’s. In the final analysis, “moderate Islam” is really nothing less than an Islam without Islam—or “Western Islam,” an oxymoron—explaining why it is viewed with great scorn outside the West (even London’s first Muslim mayor disparagingly refers to moderate Muslims as “Uncle Toms”). The idea that Muslims can be true to their religion and yet naturally fit into Western society is false—and built on an equally false premise: that Christianity somehow also had to moderate itself to fit into a secular society—when in fact, Christian principles, which are so alien to Islam, were fundamental to the creation of the West.